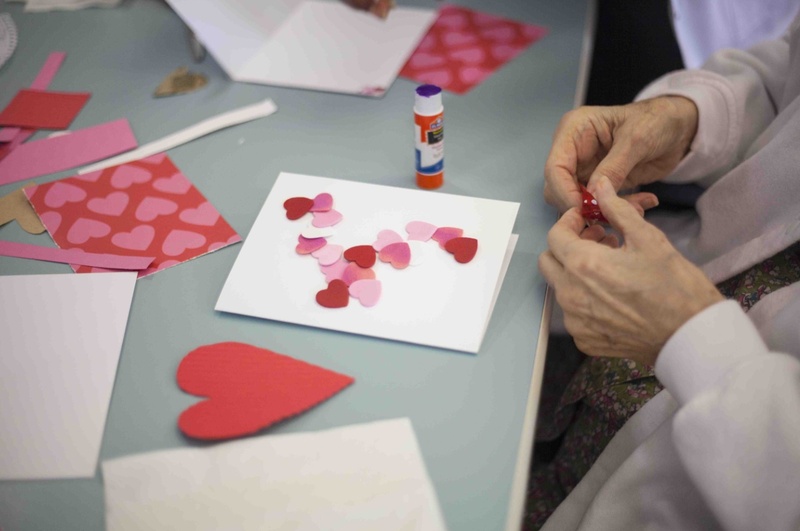 Armed with red and pink paper, doily hearts, glue, glitter, stamps and ribbon, we walked into an afternoon of joy as we hosted our Valentine’s Day Crafternoon at a local rehabilitation and long-term care facility. It was an afternoon dedicated to making Valentine’s Day cards and socializing with the residents. The tables of the recreation room quickly turned into a swirl of red and pink as the seniors wasted no time in starting their projects. Some made Valentine’s to send to grandchildren across the country, others made Valentine’s for their spouses stamping the card proudly with “True Love Lasts Forever.” One smiling woman quipped, “You are a heart stealer!” As I reached for a pile of heart cut-outs. The room was filled with smiles and I was reminded of how the simple pleasures of life, such as spending an afternoon making crafts, really does promote a healthy heart. The idea for a Valentine’s Day Crafternoon started because February is American Heart Month. According to the CDC, heart disease is the leading cause of death among men and women and is credited with 1 out of every 4 deaths. With more than 70 million Americans living with some form of heart disease, it is important to educate on ways to reduce the risk of heart disease and promote a healthy heart. So where does a Valentine’s Day Crafternoon fit with promoting heart health? Well, the concept is simple, Preferred Care at Home believes it is important to care for your heart both physically and emotionally. Research shows that smiling and having fun reduces stress and can actually decrease the risk of heart disease. As a senior home care company, it is our joy and privilege to interact with the seniors in our community. To share a smile and to gather around a table filled with paper hearts and doilies is a moment not to be taken for granted. Hosting a Valentine’s Day Crafternoon is one way we are able to celebrate life, dignity and independence. For more information about Heart Disease visit our resource page.